A brand new series, freshly downloaded from our teams in the most expanded levels, pure Source Creator Energy. This series is offered exclusively through Beyond the Ordinary, at dramatic savings relative to its market value, released on Wednesday, Feb. 27, the date of my interview with John Burgos. Interview with John, related to this offer is HERE. Purchase Link is HERE Already purchased? Great ~ you may log in here, then click here. First, please know that this is a series unlike any other. Over the almost ten years of my sharing channeled messages and insights from my Eternal Self (what I call “My Team” which includes beings such Goddess Isis, Mary Magdalene, Jesus, Quan Yin, Metatron, and so many more), we’ve created some absolutely mind-bending, heart-expanding, consciousness redefining materials. We did this together, alongside each other and alongside our Eternal Selves. More recently, particularly since my group Egypt trip in Feb. 2018, I have been shown keys and codes related to the “after life” which are completely different than what most of us know, or even have access to. It is clear that we have only scratched the surface on these topics. The Egyptians in the time of Goddess Isis were very dedicated to the bridge between the living and the after life. There were experiments tried and theories tested. Now, we continue with this bridge building in a new era of enlightenment and with an expanded, more direct level of connection to our Eternal Selves. In this series we will see that that the real bridge we are building isn’t between realities, rather it is the bridge between the individual human the its Eternal Self. When that bridge is in place, the After Life is not a concern. I can feel Goddess Isis, Thoth, Jesus, Quan Yin smiling at us in that revelation alone. It is time for these materials. We came here, in many ways, for this expansion, this personal and internal connection to Source. How is revealing the After Life relevant to us, now, and how is it applicable to our present incarnation? Many reasons. Perhaps most importantly, the distortions in the after life (we will address these) are causing humans (the vast majority of humans), to reincarnate unnecessarily. Please consider this for a moment. No one, no One has to reincarnate… ever. But if you don’t know that here, while you are alive, you are far more likely to be caught in the after life system which guides souls back into human incarnations, again and again and again. Compounding this problem is that many spiritual teachings actually incorporate this idea of sequential lifetimes as a means for a soul’s growth and progression. That, too, is a distortion. A lie (we are very blunt, all for the purpose of helping you access Your Eternal Self energies). Your true soul is Eternally Light, infinitely ascended, perpetually pure and most definitely whole, holy. Since that is your true soul nature (what I call your Eternal Self) but almost no one is aware of that most expanded level of Self, then no wonder so many spiritual seekers and experiencers have such a hard time feeling connected, on purpose and divinely intentional in their lives. Again, the vast majority of humans on Earth have been tricked into reincarnating and, thus, are automatically compromised in their energy fields. This makes for an uncomfortable, extremely challenging and, frankly, unfair life. So, let’s do this!!! 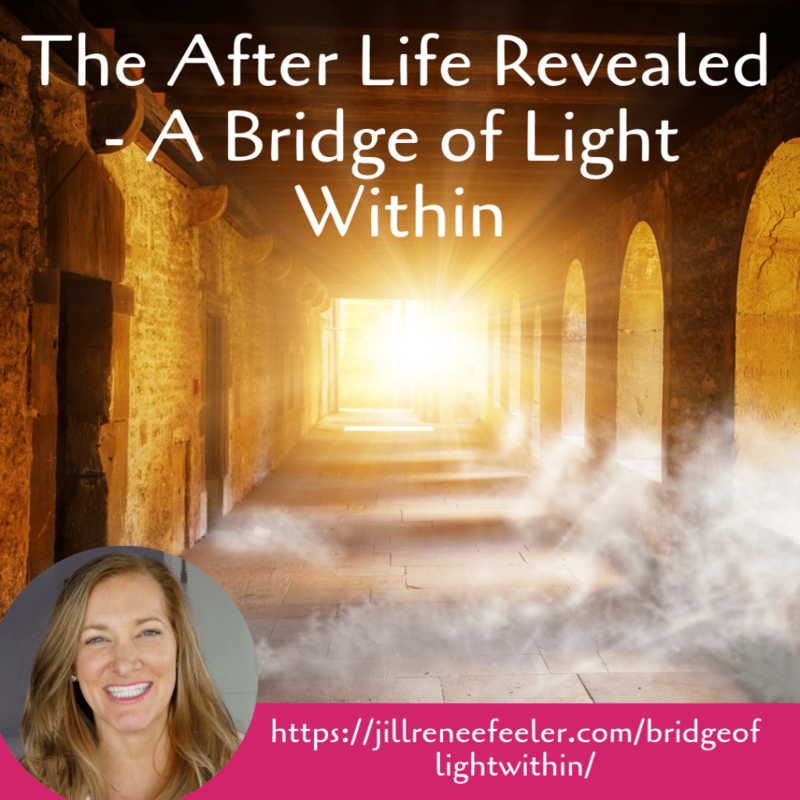 I am here alongside you in this extremely unique series to explain the after life, what happens there and how to live within the Bridge of Light energies to your Eternal Self energies. We will do so for the purpose of you being more honest, clear and connected here, now, while you are alive. The true bridge Within Self will be restored. By getting your energy field and consciousness ready for the after life transition through this internal bridge to your Eternal Self, you are then primed for your best life, now, here. Finally. Because I know many of you feel like you’ve tried everything, with varying degrees of success. I hear all the time from clients that they sense they are missing something. They sense something is off. They feel their light at times but it isn’t consistent. Through our work, we connect you to the Eternal Self energies, we point out the distortions, we clarify the Self and the liberation of light begins, and just grows stronger and brighter from there. In your personal life or in your spiritual journey have you ever felt stuck, held back and/or disconnected, like something was missing? I bet you were trying multiple things for your latest breakthrough, without knowing that the energetic foundation was inherently flawed. Now, I know this can make one feel triggered, defensive or just guarded, especially if you’ve felt quite expanded in your spiritual journey. No worries. We have a very loving, respectful but also direct and clear approach to assist you, as our fellow masters of Light. Mary Magdalene knows just how to put things to unlock those important doorways to self and she is a part of my Eternal Self energies (and most likely yours)! We make it graceful and productive for your ego (the storyteller) to drop the false teachings and easily and excitedly pick up what is true, timeless and real. We then stand within the truths; truths that are true whether one believes them or not. Eternal Self truths. When we do this, we feel liberated, wise, playful and even confident in the light that we are. The Light that we Are, eternally. And here. Ok? Sound good? We have a plan for this series. A plan I’m led to from not just my Eternal Self but our mutual Eternal Selves. Because they/we want us to know the truth. Not just for the after life, but for this human life. Truth sets Light free. Free to Be the Light we came here to Be. Not learn, not earn, not study, not start over from scratch; Be. The Light we Came Here. To Be. I’d love for you to join me in this completely ground breaking expansion. We will be doing more than pulling back the curtain on deeper levels of consciousness. We are going to rip off the curtains. And let the light in. From the inside out. I have goosebumps (God bumps) as I write this. I’m so excited. In many series we have partnered together, this group of Bringers of Light, which includes you. We continue to pioneer fresh pathways for light here. This series proves to be another additional ring of expansion, that is also primed for even those just now joining our work (welcome!). We are now to the deeper levels of taboo, mysterious and carefully veiled subjects. And we have the authority to be here in this deeper realms. We have the divine sovereignty keys needed. And so it is. This series is shared in a set of 9 empowering audio recordings, with lifetime access. We expect you will savor this series, with multiple listens; hearing, receiving, creating new energetic expansions with each listen. True multidimensionality in action. Given the nature of this special group and your contributions to the materials, a BONUS Q&A conversation is also included, now in replay format and ready for you with the materials. What I’ve found with such expanded beings as yourSelf is that your questions lead to additional, highly relevant paths of wisdom and activations to the series. That most definitely happened this time as well. Thank you for this! You are invited to this special series! In my work, we treat you as the Master that You Are, beckoning your Eternal Self energies, from the inside out. This is a very different path for spiritual growth, that is completely non-linear and wildly activating of your super consciousness. We’ve saved many spiritual seekers years of effort and size-able money, by going straight for the Eternal Self vibrations, bypassing the false soul growth, “Earth is a school” distortion. Seekers become Finders, when you know where to focus and expand. We do have a private session option for you, in very limited supply. If you don’t get one of the private session packages, please know the materials in this series are absolutely priceless and worthy of your experiencing them, even without the private session option. For those who get in on the private session offer, congratulations and nice job acting so swiftly to purchase. I’m booked out quite a ways as you will find upon booking. I recommend that you take the first available spot, trusting that the timing of your session consistently turns out to be perfect. I don’t have a cancellation list because it is almost never that anyone cancels. Trust you. Upon purchase, Beyond the Ordinary will provide you detailed, clear instructions for how to immediately access the materials. These steps are tested, so thank you in advance for following them slowly, carefully, and fully. You may need to scroll down on your screen to see all of them, especially if you purchase the private session option. I can’t wait to get started with you! Still not sure, try out this interview with John Burgos related to this Series, available HERE. Not sure if you remember me, I had a reading from you August 2017. I have purchased the Afterlife package after listening to you on BTO. I just want to commend you on the information you are bringing forth and I know this is such truth. I have invested a lot of time, money and energy into my spiritual seeking over the last 10 years in the pursuit of eliminating mental and emotional suffering and aligning to my joyful purpose and was getting frustrated that although my mind and heart was expanding, I still wasn’t seeing the results. I was more recently led myself back to me. Some of the same things I was questioning were then validated by the Afterlife information and I am so jazzed about just being my eternal self and creating from there. Through the BTO package I am scheduled to have a session with you again in July. I am not ready with my growing questions, but I have to share that my love for this series keeps growing with each recording (I am on recording 5, but make myself listen to each at least 3 times to make sure I have gleaned what I can). I believe this is by far my most favorite series EVER, and the others were already amazing!! Recording #4 answers so many questions I have carried for decades, it brought me a great sigh of satisfaction. And if that weren’t enough, what absolutely filled my heart to almost bursting was the love I felt between Yeshua and Mary M – it brought tears to my eyes. It felt so, so soothing, like Yes, this is what real love between two humans can be!! The beauty between them as their ‘we’ that they shared with us, that still exists in the afterlife (!! ), well wow, that is the epitome of a couple’s love… could they please teach a class??? I am serious!! And then in #5 the message from Zeus and Athena, soooooo amazing!! And, omg, they were not mere mythological gods but actual human beings??? Mind Blown!! So what next, Santa Clause is real too? ?